Durch einen Gemüsedämpfer wird das Gemüse schnell, einfach und mit dem wenigsten Fettgehalt zubereitet. Im Gegensatz zum Kochen hilft Dämpfen auch dabei, die wichtigen Nährstoffe beizubehalten. Die hochwertige Edelstahl-Serie Premium One sieht schick aus und punktet mit ausgesprochen viel Komfort – kleine und große Küchenchefs möchten da am liebsten gleich anpacken und loslegen. Kein Problem! Denn endlich kann man auch Edelstahlgriffe während des Kochens entspannt ohne Topflappen anfassen. Möglich macht’s die patentierte Cool+ Technology, zu erkennen an signalroten Punkten an den Griffen. Doch es gibt noch weitere Vorzüge der mit dem iF Design Award preisgekrönten Töpfe. Der Deckel sitzt fest auf, Dampf zieht durch eine Öffnung kontrolliert ab – da klappert nichts mehr, spritzt kein Wasser auf den Herd. Die Skalierung im Topfinnern erleichtert das Messen und Befüllen, und durch einen speziellen Schüttrand kann beim Abgießen nichts mehr tropfen. Der TransTherm® Allherdboden eignet sich auch für Induktion, er nimmt Hitze schnell auf, verteilt sie gleichmäßig und speichert sie extrem lang. Zum Reinigen wandern die Töpfe in die Spülmaschine, im Schrank sparen sie übereinandergestapelt Platz. Zur Premium One Familie gehören verschiedene Töpfe in mehreren Größen. No more pot holders! WMF pots with Cool + technology ensure a relaxed cooking experience. WMF has been manufacturing cookware with a unique form of handle technology since 2010. Its name is Cool+ and it effectively reduces heat conduction between the pan and the handle. This means that during cooking the handles do not become hot. A persuasive safety argument and a cool solution when heat is emanating from the hob. The Cool+ technology can be recognised by the bright red "dots" on the handles. This handle technology has been patented and exceeds the requirements of DIN EN 12983-1. The handles don´t heat up, even if your passion for cooking is burning. 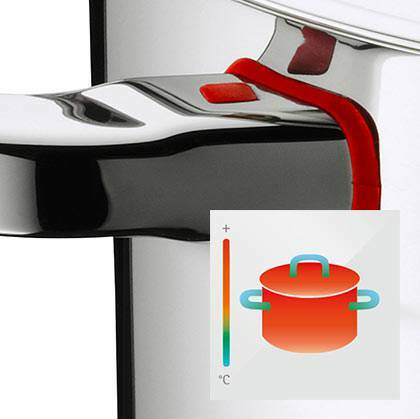 The innovative technology reduces heat conduction between the pot and the handles.  Patented technology exclusive to WMF. Steam cooking – there is no healthier way! Steam cooking is the perfect way to prepare food if you care about preserving as many vitamins and minerals in your meals as possible. The flavour is held inside the steamer, just like the most important vitamins and minerals. Using the steamer is always an option whenever food doesn't need to be browned over a high heat and when you're not looking for a crispy crust. Therefore it is ideal for vegetables of any kind and also for fish or poultry. Because the food doesn't lie directly in the water but is cooked by the hot steam, the flavour and vitamins remain largely intact. Prepare tender vegetables and succulent meats the easy way yet still enjoy the fullness of the flavour as well as a high-quality meal full of nutritional ingredients. The gentle cooking method which the steamer makes possible allows you to save on salt and spices as well as on fat. The finished dishes are not only healthy and tasty but are also simple and easy to digest. Steamers work based on a simple principle, just like steam cookers. Food isn't submerged in the water but is cooked by the hot steam. This gentle and healthy way of cooking is made possible by an insert placed in the steamer. The vegetables or other foods lie in the sieve-like insert whilst the pot sits directly on the hob and is filled with water. The water is brought to the boil, the hot steam rises and envelopes the food being cooked. When it is ready the finished dish is taken out of the steam and can either be served straight onto the plate or further processed in some other way. The vegetable steamer can also be used to cook rice or pasta perfectly without losing any precious nutrients. Pasta cooks to al dente just as easily in the steamer as in the pasta pot and doesn't have to be carefully drained. You will find a variety of different pots and pans on offer in the WMF assortment. From the traditional high casserole to the steamer in our special cookware range, for every dish or type of food you will find the matching cookware – and in our kitchen gadget category you'll be sure to find the spoons, fish slices, whisks or slicers you need to get the job done.